Creatine is a nitrogenous organic acid that occurs naturally in vertebrates and helps to supply energy to muscle. It is a break-down product of creatine phosphate in muscle, and is usually produced at a fairly constant rate by the body (depending on muscle mass). On a daily basis approximately 2% of the creatine found in the body is converted to creatinine. Creatinine is transported through the bloodstream to the kidneys. 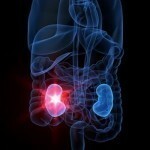 The kidneys filter out most of the creatinine and dispose of it in the urine. 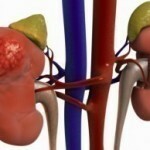 Creatinine serves a major role as it can be used to determine kidney functionality. Creatinine levels tend to elevate if the kidney suffers damage; as such extremely high levels of creatinine may be a warning of kidney failure. In male and female adults normal creatinine levels range from 0.6 to 1.2mg (per deciliter) and 0.5 to 1.1mg respectively. Elderly persons will have lower creatinine levels than normal whilst infant creatinine levels should be approximately 2.0. Standard blood and urine tests are used to routinely check the amount of creatinine in the blood. Persons with abnormally high creatinine levels may need to use dialysis to lower creatinine levels. Dialysis helps the body by performing the functions of failed kidneys. Kidney function is determined by creatinine and creatinine clearance tests which are used to measure creatinine blood and urine levels. The creatinine clearance value is found from the amounts of creatinine in the urine and blood and from the amount of urine that is passed in 24 hours. This value is the amount of blood cleared of creatinine per minute, based on body size. Men will have higher creatinine blood levels than women since the men normally have more muscle mass. Also, people who have large muscles, such as athletes, normally have above-average blood creatinine levels. Low blood levels of creatinine: are not common, but they do not usually indicate anything serious. They are usually associated with conditions that result in decreased muscle mass. Such conditions may be muscular dystrophy, or aging. Low levels can also mean some types of severe liver disease or pregnancy and a diet very low in protein. Low creatinine clearance levels: are an indication of severe kidney damage. Kidney damage can result from severe infection, shock, cancer, low blood flow to the kidneys, or urinary tract blockage, heart failure, dehydration and liver disease. Muscular dystrophy and related muscle disease causes muscles to weaken and waste. The muscular dystrophies (MD) consist of over 30 genetic diseases characterized by progressive weakness and degeneration of the skeletal muscles that control movement. Some types of MD affect babies and young children while others are more consistent in adulthood. The amount of creatinine in the blood depends partly on the amount of muscle tissue. Persons with MD will have low creatinine levels as their muscle mass decreases. Creatinine levels do not generally vary with diet. Creatinine levels may be 10%-30% higher in people who eat a diet that is very high in meat or other protein. Creatinine levels relate to muscle mass and to kidney function. Elderly persons will have less muscle mass than younger persons as well as their kidneys tend to lose some functionality with aging. As such the older a person get the less creatinine levels will be. Usually all that is required is to stop taking creatinine supplements. If that doesn’t work, you could have a serious medical issue with your kidneys and you should see your doctor.